The suspenseful, little-known true story of two determined pioneers who made the first dive into the deep ocean. 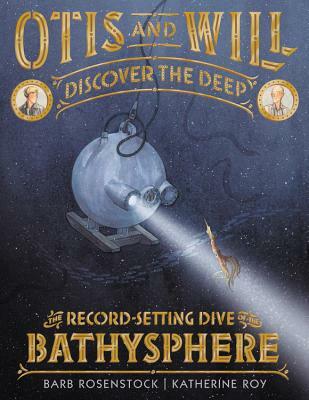 On June 6, 1930, engineer Otis Barton and explorer Will Beebe dove into the ocean inside a hollow metal ball of their own invention called the Bathysphere. They knew dozens of things might go wrong. A tiny leak could shoot pressurized water straight through the men like bullets! A single spark could cause their oxygen tanks to explode! No one had ever dived lower than a few hundred feet...and come back. But Otis and Will were determined to become the first people to see what the deep ocean looks like. This suspenseful story from acclaimed author Barb Rosenstock with mesmerizing watercolors by award-winning artist Katherine Roy will put you right in the middle of the spine-tingling, record-setting journey down, down into the deep. Barb Rosenstock is the author of the Caldecott Honor book The Noisy Paint Box, Thomas Jefferson Builds a Library, The Camping Trip that Changed America, and several others that have received numerous accolades and starred reviews. She lives in Illinois with her husband, sons, and two big poodles. Katherine Roy is the author and illustrator of How to Be an Elephant and Neighborhood Sharks, a Sibert Honor book. She is also the illustrator of the Expeditioners series and of Buried Beneath Us. She lives in Oregon with her husband and son. * "Rosenstock's masterful pacing as the tank is submerged leaves us nearly breathless.... Roy's fluid watercolors and dramatic perspectives capture the heart-pounding emotion of the scientists' dangerous journey." * "This is a true science adventure story...an outstanding work of nonfiction." "Rosenstock and Roy's collaboration celebrates scientific teamwork and an exciting first in deep-sea exploration." "Meticulous research underpins everything with fascinating detail and sometimes terrifying drama, inextricably intertwined in this tribute to STEM, teamwork, and the 'last frontier on earth.'" "A repeated refrain of 'down, down, down' and ever-darkening backgrounds punctuated by moments of gasp-inducing mishaps ratchet up the tension, but when they finally make it to 800 feet below the ocean surface, it's all worth it for the view of glowing, alien creatures, which Roy powerfully depicts in a swirling, dusky double-gatefold spread."